MADELINE K. LUKASHUK, TRUSTEE OF LUKASHUK REALTY TRUST vs. EDWARD GIAMBROCCO and ESTHER GIAMBROCCO. Plaintiff seeks to require Defendants to try their title to land in Leominster and Sterling. Plaintiff also seeks to quiet title to the same land. Plaintiff abandoned Count Three of her complaint, a claim for damages. Defendants counterclaimed, claiming title to the disputed	land by adverse possession. Defendants also cross-claimed against New England Power Company and against Paul R. Lukashuk, individually. On December 11, 1990, by stipulation, a judgment of dismissal was entered in favor of the Power Company. A motion to dismiss brought by Mr. Lukashuk under Mass. R. Civ. P. 121 (b) (6) was allowed May 29, 1991. That left in the action Mrs. Lukashuk, as Trustee, Plaintiff, and the Giambroccos, as Defendants. A trial was held on October 2, 3 and 4, 1991, December 12, and 13, 1991 and January 9, 1992. A stenographer was appointed and recorded the testimony. Forty-nine numbered Exhibits (some with multiple parts, but with Nos. 27 and 33 being blank) were presented. Exhibits 19 A-F, 39, and B were marked for identification but not allowed into evidence. All other produced Exhibits (including Nos. 25, 26, 28, 29, 30, 31, and 32, on which a determination was deferred) were allowed into evidence. The following witnesses testified: Allen F. Paige, a registered land surveyor; both Defendants; David J. Pineo, Police Sergeant for the Town of Sterling; John J. Valentino, former sterling police officer; Paul V. Largey, a used car and truck dealer; Neree Roseberry, an artisan well dealer; James P. Flanagan, long-time resident of the area; Luciem A. Bouthiller, a businessman in the area; Arthur Generalis, a New Hampshire resident who married into the Drenova family, which formerly owned the Lukashuk Property; Harold Heinold, Jr., who grew up close to the properties and was at one time employed by the Drenova family; Greg Aubin, who lived close to the properties; Georgia Drenova, one of the former owners of the Lukashuk Property (her Deposition was also admitted into evidence as Exhibit 37); Paul Lukashuk, the beneficiary of the Lukashuk Realty Trust; Emily Ciccone, a real estate broker involved in the sale of the Lukashuk Property by the Drenovas to the Lukashuk family; Carlton A. Stillings, a retired State Police sergeant; Madeline Sambito, a family friend of the Giambroccos; and Clyde Wheeler, a surveyor engaged by the Lukashuks. I find and rule that Defendants have established title to some, but not all, of each of the two parcels of land claimed by them by adverse possession. 1. There are two parcels disputed in this action. Exhibit 1 is a plan (the Paige Plan) entitled "Plan of Land in Sterling, Massachusetts owned by Edward & Esther Giambrocco" dated April 3, 1990 by A. F. Paige Associates, Registered Engineers and Surveyors. A copy of a portion of the Paige Plan is attached to this Decision. 2. On the Paige Plan there is an area (the Giambrocco Property) on the westerly side of Leominster Road (State Highway 12) in Sterling shown as "Area=13,449.3 s.f." The northerly boundary of the Giambrocco Property is coincident with the Town line between Sterling and Leominster. Looking at the Giambrocco Property from the road, there are at the rear of the property three buildings, the rear of each of which is at or slightly over the property line between the Giambrocco Property and property (the Lukashuk Property) owned by Plaintiff. These buildings are, moving from right to left, a one-story wood frame building, a one and one­half story wood frame garage, to which a shed is attached, and a one story brick building. To the south of the Giambrocco Property is a long strip of land along the road, owned by Henrietta Giambrocco, Edward's mother. 3. The Lukashuk Property surrounds the Giambrocco Property to the west and north. It is in both Sterling and Leominster. It has no road frontage in Sterling but has 90.75' frontage in Leominster. The portion of the Lukashuk Property shown on the Paige Plan is but a small part of the whole. The major part of the Lukashuk Property (31.525 acres) was owned by Theodore Drenova, Georgia Drenova and Betsy (Drenova) Generalis in 1982 and was part of a larger area of about 67 acres, the Drenova farm, which has been in the Drenova family since at least 1913. In 1982 the 31.525 piece was conveyed to Plaintiff (Exhibit 9). The Yellow Parcel (defined below) was part of an area owned individually by Theodore Drenova since 1943 (Exhibit 35). We do not have a deed from Theodore into Plaintiff, but the parties stipulated that the Yellow Parcel is owned by Plaintiff. The Drenova farmhouse was on the far side of the Drenova farm, away from the Giambrocco Property. 4. The more important area in dispute (the Yellow Parcel, so designated throughout the proceedings) is a trapezoid located entirely in Leominster, having a frontage of 90.75' on Route 12 (which in Leominster is known as Central Street), a 78.80 common boundary with the Giambrocco Property, a rear boundary of about 30' and a northerly boundary of about 95'. As shown on the Paige Plan, a triangular part of the Yellow Parcel at its southeast corner is covered with bituminous concrete and a slightly larger part is covered with crushed stone. A driveway leading into the Giambrocco Property passes over the bituminous area on the Yellow Parcel, as shown on the Paige Plan. The major portion of the Yellow Parcel is encumbered by an easement in favor of New England Power Company and electric lines pass over the northerly corner of the Yellow Parcel. There is a wire fence at the rear of the Yellow Parcel. A gate, whose location was much disputed, I find to be located on the boundary line between the Lukashuk Property and the Giambrocco Property, just south of the Yellow Parcel, but not on it. I do not, however, attach significance to the fact that the gate is not on the Yellow Parcel. 5. The second area in dispute (the Pink Parcel) is entirely in Sterling and is an irregularly shaped parcel behind the Giambrocco Property and in part also behind the Henrietta Giambrocco property. All three of the buildings on the Giambrocco Property encroach slightly onto the Pink Parcel. 6. There is no dispute as to record title. Plaintiff owns the Lukashuk Property of record (Exhibit 8) and Defendants own the Giambrocco Property of record (Exhibit 7) (in each case, assuming no transfers since the trial). The Giambroccos acquired the Giambrocco Property in 1958, from Edward's father, who acquired in 1939. Plaintiff acquired the Lukashuk Property first in 1982. Plaintiff sold it to one Slade or Slade's Trust in 1987 and reacquired the Lukashuk Property in 1989. 7. Counsel stipulated that in 1961 New England Power Company paid the Drenovas about $5000 for easement rights over an area of about one and one-half acres, including the Yellow Parcel. 8 . Counsel also stipulated that the issue of Defendants' claim to the Yellow Parcel by adverse possession came to a head in May 1985. 9. Defendants established the bituminous concrete area and the driveway in 1952. At Defendants request the Power Company put crushed stone in approximately the area shown on the Paige Plan in 1961, when the power lines were installed. They also leveled the area to the north of the crushed stone area and at that time Defendants seeded that area. 10. Edward Giambrocco established a used car sales business at the middle and northerly end of the Giambrocco Property in 1952 and has maintained that business since then, under the name "Edd's Auto Sales". The number of cars displayed for sale varied depending on the season and business conditions. By Edward's admission, there were times when there were as few as five cars for sale. 11. At no time did Defendants pay any of the real estate taxes on the Yellow Parcel or the Pink Parcel. Those taxes were always paid by the Drenova family and, presumably by their successors in title after they sold the Lukashuk Property in 1981. 12. The Lukashuk Property was part of the Drenova dairy farm. 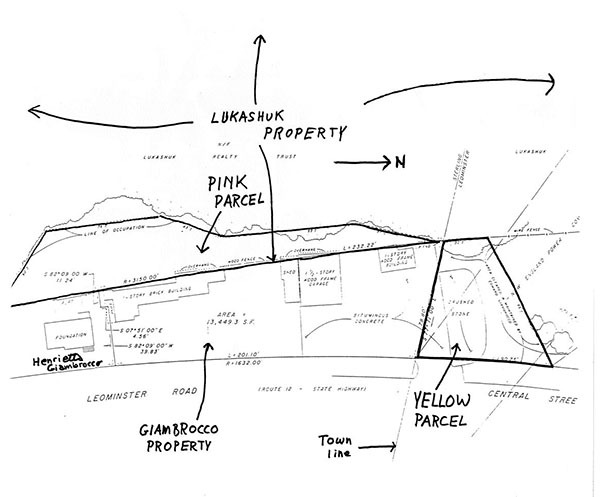 Prior to Defendants acquiring the Giambrocco Property the Lukashuk Property, including the Pink Parcel, was pastureland. At some time not clear from the testimony, the Pink Parcel became wooded or covered with scrub vegetation. 13. From the early 1950's when Defendants established their residence on the Giambrocco Property, they from time to time used portions of the Pink Parcel as a back yard. They loamed, seeded and maintained these portions and used them for recreation. They placed a birdbath and bird feeder there and from time to time tables and chairs. They never fenced the Pink Parcel. The Pink Parcel is not wild or woodland such as to require fencing, under Senn v. Western Massachusetts Electric Company, 18 Mass. App. Ct. 992 (1984). The trees and other vegetation to the west of the Pink Parcel served as its natural boundary. Children played in the area from time to time. None of these activities could be seen from Route 12, being screened by the structures and fencing established on the Giambrocco Property by Defendants. 14. I find that Defendants have not established use of the Pink Parcel (other than the building encroachments) of such character and continuity as to afford them title by adverse possession. They have established title to the areas under the building encroachments lying north of the common boundary, but otherwise have not established any interest in the Pink Parcel. 15. The intensity of Defendants' activities on the Yellow Parcel varied from part to part. One part (the Front Yellow Area) I describe as the area bounded on the east by the line of Central Street, on the south by the Sterling/Leominster Town Line, on the west by a line twenty feet westerly of, and parallel to, the line of Central Street, and on the north by the northerly line of the "Bituminous Concrete" area as shown on the Paige Plan. The Front Yellow Area, therefore, is the first twenty feet of the "Bituminous Concrete" area in from Central Street. 16. From the establishment of Edd's Auto Sales in 1952 until restrained in 1991 in this action Defendants used the Front Yellow Area as a display area for cars for sale and for access. That use was interrupted for two or three occasions of about ten days each when Mr. Giambrocco was ill in 1983 or 1984, but, considering the type of use, the use was continuous. I do not credit Plaintiff's testimony that Defendants moved cars from the Front Yellow Area at the request of the Drenovas (although they may have done so as to cars in the remainder of the Yellow Parcel). 17. Defendants did not disclaim ownership of the Front Yellow Area, as suggested by Plaintiff. If on a few occasions they did not speak up affirmatively to claim ownership when the occasion might have suggested they should, the circumstances were ambiguous enough so that their silence cannot reasonably be used against them. 18. I find that Defendants' use of the Front Yellow Area as described above from the early 1950's until 1991 was actual, open, notorious, exclusive, continuous and adverse and that they have established title to the Front Yellow Area by adverse possession. 19. Defendants have used portions of the rest of the Yellow Parcel over the years for parking vehicles for sale in Edd's Auto Sales and for repair of vehicles but Defendants have not established that their use was continuous and covered the entire rest of the Yellow Parcel. Their use of the rest of the Yellow Parcel was sporadic and they have not established any interest in the part of the Yellow Parcel outside the Front Yellow Area.